The Drummond Will is an English black comedy. It’s often funny, and it sometimes works. The Drummond Will is filmed in black and white which works in its favor by making it seem heavier and more timeless, though those are some of the script’s weaknesses. 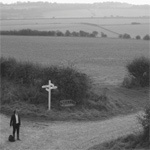 Danny (Phillip James) arrives late to his father’s funeral. His full head of hair flying, he wears a suit and clean white shirt but not a tie. He exudes charisma and charm, and knows it; he seems to assume he will be forgiven for arriving late. His brother Marcus (Mark Oosterveen) is much more tightly wound. He scolds Danny for showing up late and is ready to drive home to London. But Danny wins (as always, we assume) and convinces him to stay in the village for the weekend. They have a drink that night with their uncle Rufus and plan a little fishing for Sunday morning. Arriving at their father’s country house they find a neighbor hiding in a cupboard, red-handed, holding a sack of money that must have been their father’s. Until now it could have been a gentle English comedy. But at this point the comedy escalates from the gentle British variety to the out-there Monty Python variety. Death, greed, and fear take over and drive the plot the rest of the way. The brothers don’t know why their father would have thousands of pounds in cash in his house but they decide it is theirs. They take the money from the burgling neighbor and hide it. They are blackmailed for it. They accidentally kill someone for it. They reveal it to someone else who then tries to kill them for it. They suspect someone else of learning about it and accidentally kill him for it. At times The Drummond Will won me over. Marcus’s Pythonesque outbursts of frustration made me chuckle, and I couldn’t help but like Danny. At other times, it feels like the actors are hamming it up, and I instinctively feel some resistance in that situation. The delivery of the comedy is often deadpan, but then there are reaction shots that reveal a filmmaker winking. The characters are sometimes exaggerated to the point you’d expect to see them in a three-minute Monty Python sketch, but then the film plays on, with a traditional three-act plot, which requires more believable characters. In other words, for every high point, there’s some sort of compromise that doesn’t work as well. But if you’re looking for a comedy to round out your festival schedule of issue documentaries and Iranian cinema, give The Drummond Will a chance.